My capstone assignment was to develop any project of my choosing that I felt would expand my design skills. To combine my studies in advertising and design, I decided to create an advertising campaign. This ad campaign is an exploration of how we impact marine life through waste of single-use plastics. This began as a standard advertising campaign, but quickly evolved to include my interest in movie poster design; something that could effectively reach my target audience of millennials. Research shows that millennials will likely be a generation that changes the Earth for the better, as they are more concerned about how their actions affect the environment. Hence, the objective of this campaign is to convince millennials to change their behavior and habits of plastic use, as well as to increase their awareness of the changes they can make. Research also shows that images that display marine lifewith plastic in the ocean are the most likely to resonate with this audience, whereas images showing one or the other are less effective. 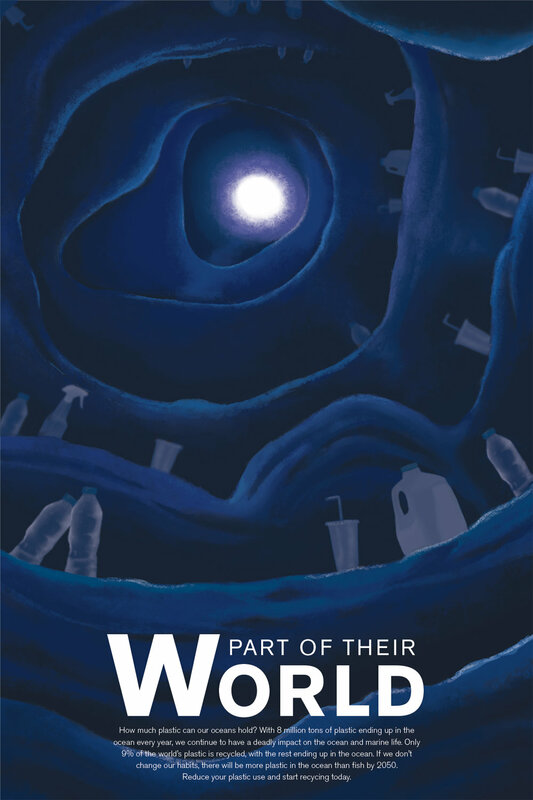 From this key insight came my strategy of showing marine life interacting with the waste that we produce. Nostalgia, a current trend in advertising, was used as my tactic through movie posters. This use of nostalgia takes the viewer to a more comforting and familiar time. Each execution is based on a different movie centered around the ocean and marine life. Some of the posters’ visuals are appropriated, and then twisted to form a new narrative. The movie’s titles are then transformed into a headline that is developed to further push the message conveyed in the visuals. This combination of transformed visuals, headline, and body copy form a message of how plastic waste affects ocean life, as well as how millennials can make a change to better the world. Each poster functions similarly to a movie poster, as a 24x36 print.